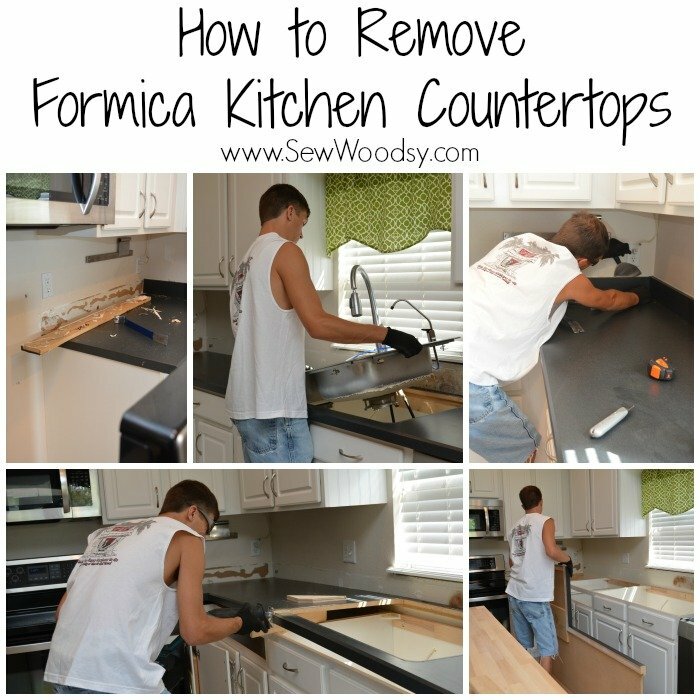 Have you ever wondered how to remove formica kitchen countertops? 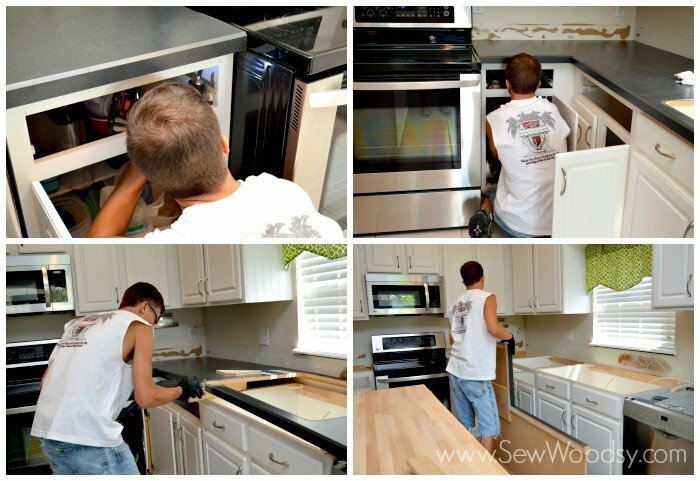 Well, we are here to give you a few of our tips and tricks we used when we removed our formica countertops last summer/fall. I knew once the main countertops were gone that the kitchen would be officially out of commission. What we had planned to only be a weekend out of commission turned out to be a week and a half. No cooking for me for that week and a half–it was 100% take-out. Yes, hypothetically I could have cooked and we could have manually washed pots and pans in the bath tub, but lets be honest. I needed a little additional motivation for Jon to get the kitchen done. He doesn’t mind eating out once or twice a week, but a whole week of it will put him over the edge. So if I had to be without my precious kitchen for a week he was going without home cooking for a week! I think that’s fair! First up, using a box cutter begin cutting the caulking from the tops of the countertops. 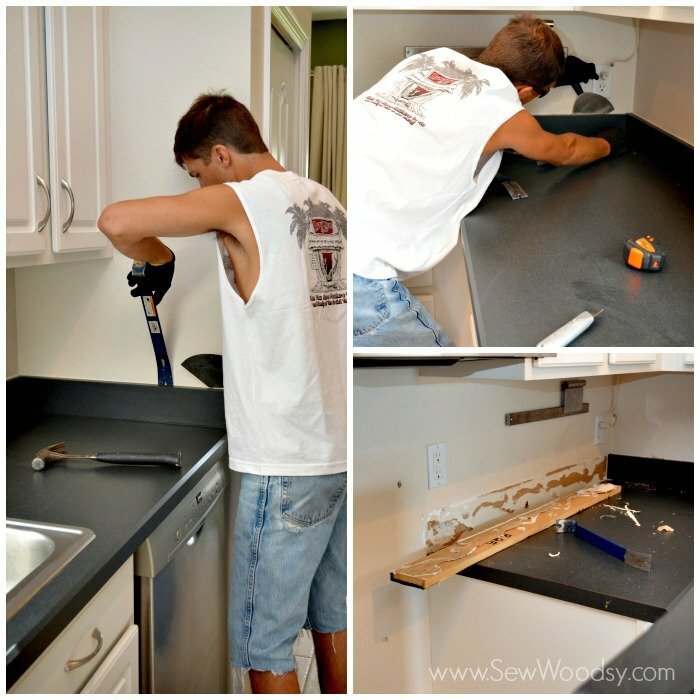 Then use a crow bar and carefully start to remove the “back splash” pieces. Be prepared–it will most likely rip some dry wall out. You also might uncover mold–like we did near the sink. This was due to water getting in between the formica and drywall. Freaked me out at first, but Jon said this is common when formica is used by a sink. Next up, time to remove the sink. You’ll need to disconnect the water. 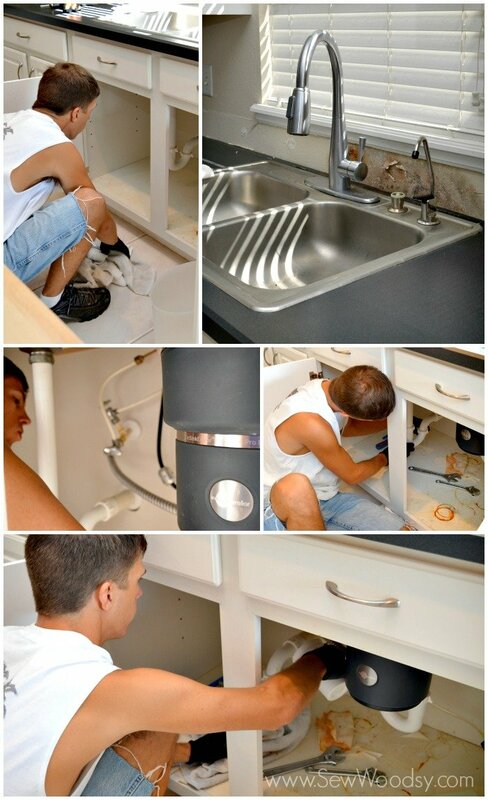 You’ll want to have towels/buckets on hand as well as a cup of water to pour into the opened up exposed drain. You do this so you don’t smell all the nastiness from the garbage disposal. We had no idea, but we had a small leak going on underneath our sink and didn’t realize it until Jon went to disconnect the sink! Next up, remove the sink! There are screws that hold your countertop in place underneath the counter. Go underneath the counter and begin removing all the screws. Once you’ve done that they should come off like butttahhh! Because we had one really long countertop, Jon chose to cut where the sink was to make it more reasonable to carry out to the garage. Remember, I was in the wee stages of pregnancy at this point so the only thing I was able to do was take photos! 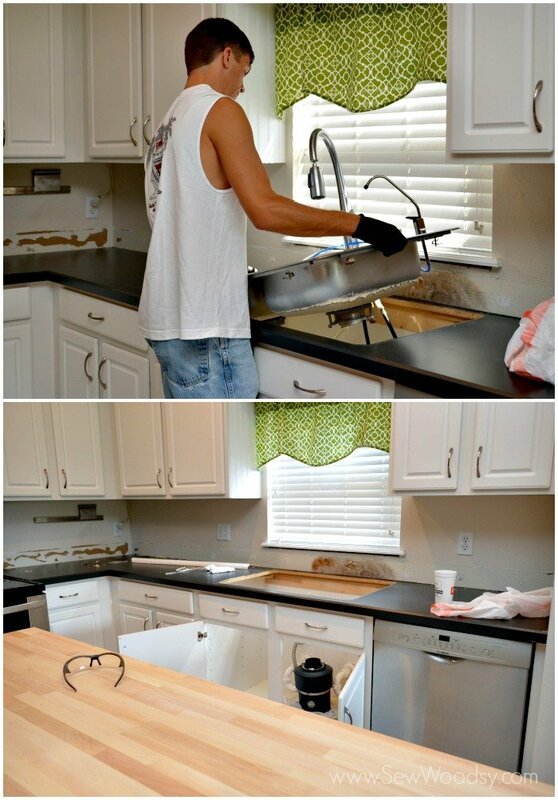 He also did this to be able to use it as a partial template for the next sink. And this is the last photo we will leave you with… Jon looking at the massive space the builder left when working on the kitchen. 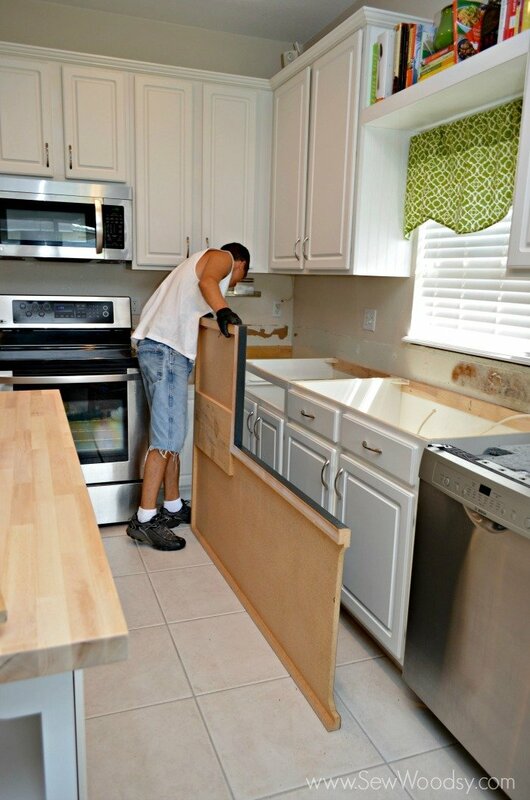 On a side note, have you ever removed formica kitchen countertops? Do you have tips and tricks we didn’t include? We would love to read about them below.